Maximum International went all the way in Poreč’16 and finished the ESBA Championship in Croatia without a single loss. The team with players from Russia, Croatia and Germany defeated Lithuanian side Kamane LT – Augma 39-29 in the final of the W50 competition. The game was even at the end of the first quarter, but Maximum won the second period 12-2 ran away to a double-digit lead. Although Kamane LT – Augma had closed the deficit in the third period, but Maximum eventually restored their lead. Nadezda Bukharova was the leading scorer of the game with 16 points and five rebounds, while Irina Terenina and Ekaterina Loginova chipped in with eight points apiece. Loginova also received the MVP trophy of the group. 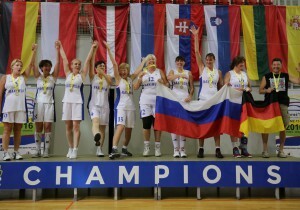 Ladies Legion from Ukraine finished third in the W50 category. Meanwhile, Ladies Germany took home the W55 crown. Since there were no other teams in the W55 age category, the German side competed with teams from W50 teams, earning one win in four games. Heike Schonau was named the MVP of the group.